Rate this Article The rise of Tanki X as one of the most competitive, thrilling and immersive 3rd person shooter tank game proves its potential to be a title that can be used in eSports. Let’s take a look why. To begin with, Tanki X is already an eSport on its own. The game contains most of the properties that can be found in other multi-player games that are officially used in eSports. However, in order for a game to be used in huge eSport events, there are certain requirements or criteria that the game must adhere to in order to take its place among the most popular titles in the industry. 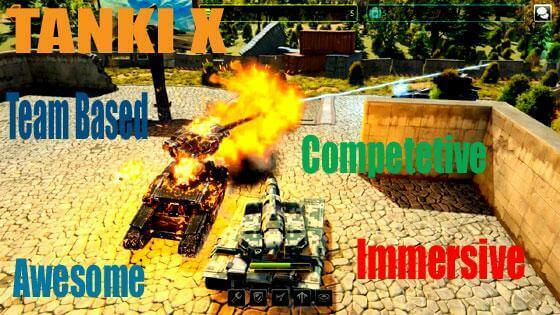 In this Tanki X article, we will examine the most important eSports requirements for a game and how it relates to the current developing state of Tanki X, present some suggestions and finally draw a conclusion on where Tanki X is, and what is needed for it to become an up and coming major eSports title. First and foremost, like most traditional Sports, eSports is a spectator sport. To be able to be used in eSports, the game should have an audience. The main eSport games like DOTA2, LOL and CounterStrike where able to grow an audience base through the years that a major event will involve an entire stadium packed with a shouting and cheering crowd with a price pool that would make Pro players practice up to 18 hrs a day just to win the match. Of course the game will not have that huge an audience to begin with so it will have to start small but growing a gaming community where both players and fans of the game can join and contribute to its growth. This will mean tournaments (On-line and LAN), exposure through social media like FaceBook and Twitter and playback and live streaming of game matches and game play like those shown on You Tube and Live Twitch. Tanki X has a community albeit still pretty much at its early stage. It has exposure via social media and it has game play videos and reviews in You Tube. Tanki X needs to grow and establish its audience base. More online tournaments will be needed and broadcasted through live stream via Twitch to a community audience which in time will grow with the games popularity. Doing this however may possibly but not exactly kill but rather undermine Tanki Online which currently has a stronger position with the Tanki community (they both use the same community) cemented on TO as the game came first. Just like Valve had to address the situation between CS1.6 and CSGO in terms of eSports, Tanki X developers may have to do the same thing. An eSports game must have a riveting, fast paced and exciting drama to watch that will cause the audience to stand up and cheer for the team or clan that they support. This will depend on 2 things, the game and the players. The game should be intense, competitive, fast paced, and well balanced. There are many good games that are challenging but the aspect of a team vs team or a one on one player fight with a timeframe an audience can sit through to completion is a must. Fast paced Real Time Tactics and Strategy games (RTTS) like StarCraft and DOTA are perfect for this as well as the team based FPS games like OverWatch and Halo. After all, almost no one would want to sit in the stadium for several months to a year just to wait for a game like StarDrift Empires to declare a winner. As for the players, skill is important. It may just be a computer game but the players no matter how young or not so young as they are are considered professionals. These guys and gals practice playing the game all day long and treat it like a regular job. Just as your favorite Basketball star drives himself to perfect a 3 point shot, eSports Pro Players have to master the game, plan their strategies and execute their own special tactics which could save their skin at the most crucial moments of the match which will cause the crowd to scream as they have never seen a tactic like that before. Tanki X has these, the strategy, the tactics and the players. The game however should be adjusted for the balance factor not only through player ranking (which is already being done) but the game play itself. The armor health and weapons as well as tank speed should be standardized and balanced and supply caches eliminated for the match, so everybody starts and ends at an equal footing. Notice CounterStrike, no health packs. You get hit a lot and loose your health, you’re out of the match. A standard principle eSports FPS games adhere to. As for players, Tanki X will need more active clans and teams and a lot of players in general. As the community currently stands, most of them are still in Tanki Online. Another important factor would be the price of the game. Commonly, eSports titles are free2play. However, an immersive game with a very affordable price tag like Call of Duty may be able to gather enough players and a sizeable crowd to declare it as an eSports title. CSGO on the other hand inherited its solid fan and player base from CS1.6. Tanki X is free2play. One last factor to discuss and the biggest one of all is money. The game should have money, eSports is a very expensive endeavor which requires a lot of capital and investment to get of the ground. The developers as well as the organizers will need some pretty wealthy sponsors to defray the costs of the entire caboodle (venue, equipment, support personnel, shoutcasters and broadcasters, live telecasts eic…) The sponsors will have to be assured that they will get back what they spent in terms of profit and-or advertising so the expected number of the attending audience will be a must to consider the event as successful. With a price pool that big, huge events like ESL will really need to cover their ground. These are just some of the things needed for a game to be included in the annals of eSports. Tanki X has the potential needed to be one of them but a lot of work will still have to be done as well as the time needed to grow the game for the international eSport scenes. There are many big businesses in Russia as well as internationally which can sponsor the game in the times to come. For now, Tanki X must do what Tanki X does well and that means providing one of the best competitive and immersive 3PS game play available today and…may the best tank win!